"Sunny Daze" Sleeps 4. New mattress 2018! Second floor condo with queen bed and sleeper sofa, room divider with seating area with small breakfast table, sleeper sofa, microwave, mini refrigerator, 4 cup coffee maker, dishes and utensils, double sinks, 2 flat panel TVs, DVD players, brand new shower and tub. On site swimming pool, quick walk to the pier, restaraunts, playground, museum, Friday night summer concerts and the beach. Free wireless internet access! Non-smoking. What a great place. VERY clean and comfortable. Everything (convenience store, restaurants, beach access) is within easy walking distance. The Ocean Isle Friday night free concert was across the street. What a bonus. Three adults and plenty of room for everyone. We never heard any noise from the people above us or beside us, which means they did a great job of sound-proofing the walls and ceiling. Very pleased with our stay, and plan on going back. Excellent, affordable option for us. Definitely recommend. Short last minute beach getaway. We were very happy with Causeway Inn and unit 206! Perfect size for a couple. Well kept and decorated. Beautiful sundeck(got takeout and ate supper there one night). Nice clean, refreshing pool(perfect depth and size for kids). Not ocean front but really close. We did not mind the short walk to beach. It is central to restaurants, shops, putt-putt. We walked to most everything we did. Planning to go back again! Escape all the hustle and bustle from the busy beaches at Myrtle. Very relaxing. A couple blocks from beach. Nice beach area. Several restaurants within walking distance, beach shops, breakfast at the pier, convenience store, ice cream store, and much more. 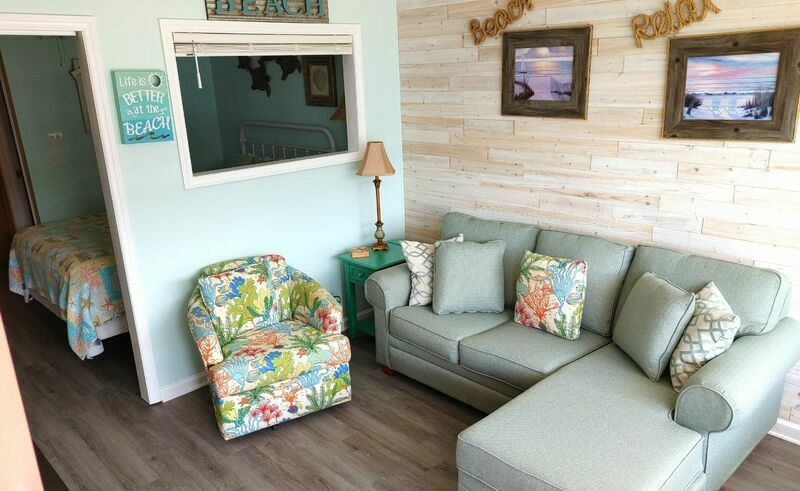 Unit 206 very beachy decor and homey. Can bring portable grill to cook outside on concrete. Great sundeck and lounging area. Nice size pool. These units are privately owned and well taken care of. You won't be disappointed with your stay. Great facility. This is a very homey and comfortable. Sunset from the deck is awesome. Beach a couple blocks from facility. Restaurants and entertainment are within short walking distance. Pool at bottom of stairs. Great check in/check out procedure. Enjoyed our stay very much. This unit is perfect for a vacation! Close to everything in Ocean Isle! Lots of activities across the street from the condo, the pool at the bottom of the steps, and a wonderful deck to watch the sunrise or sunset perfectly from! Definitely would recommend and will definitely be returning! Loved staying here! Centrally located to all the restaurants and action. Great decor. Very clean. Nice extras like a Keurig with Kcups, shampoos, 2 flat screen tvs, and bikes to ride. Beautiful views from the deck. Walking distance to lots of places including the beach and pier. Can't wait to go back!